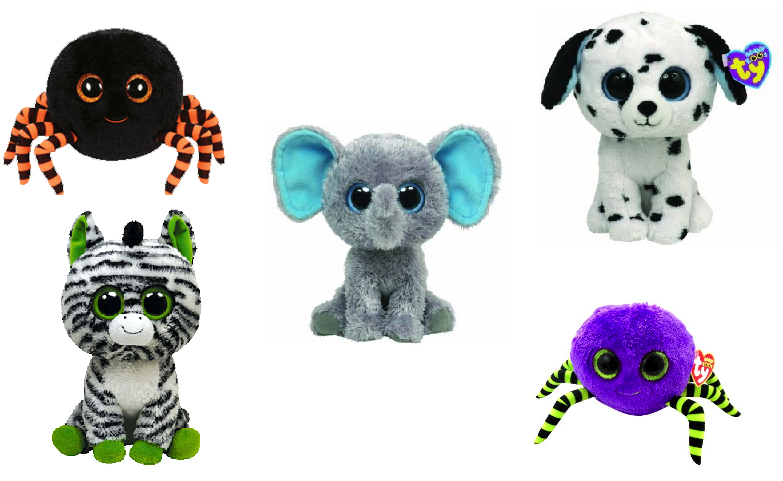 Ty have announced that five Beanie Boos will soon be retiring! The blue-eared Peanut the elephant, Zig-Zag the Zebra, Fetch the Dalmatian and both the black and purple variations of Crawly the Spider will all soon be off the shelves so keep your eye out for them as they’ll soon be unavailable. The news that Peanut, Zig-Zag and Fetch didn’t come as a surprise as they have been available for some time, however, the two Crawly versions came as shock as they are only a year old! 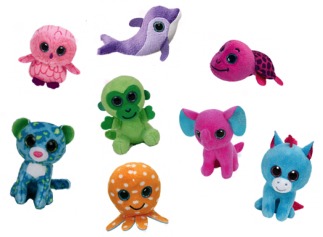 Have you got any of the latest Beanie Boo retirements? Cecil Beanie Baby could be available at the end of the month! Ty Warner made an announcement in August that Ty Inc. would be releasing a lion Beanie Baby in honour of Cecil the lion, the famous Zimbabwean lion who was tragically killed. 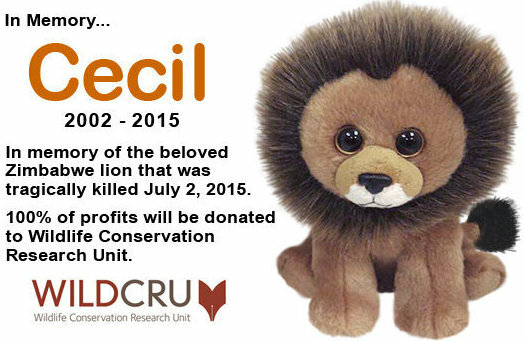 Ty hoped to raise awareness for animal conservation by releasing a Beanie Baby named Cecil and donate all the profits to the Wildlife Conservation Research Unit (WILDCRU). Ty Warner made a statement about the release of the Beanie Baby, saying “Hopefully, this special Beanie Baby will raise awareness for animal conservation and give comfort to all saddened by the loss of Cecil”. According to a Ty spokeswoman, Cecil will be available in stores at the end of this month at the price of $5.99 with all profits going to WILDCRU, who were monitoring Cecil at the time, to help with ongoing conservation efforts and research into enabling humans and wildlife to co-exist together. 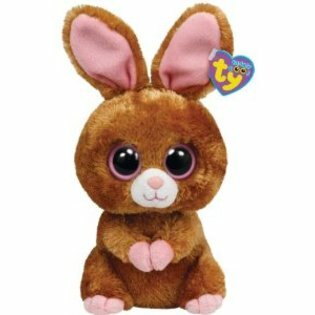 Teenie Beanie Boo Promotion Nearly Over! Since 4th July, McDonalds have been giving away one of a selection of eight Teenie Beanie Boos with every Happy Meal. There are now only 3 days left of this promotion, which ends on 31st July! Coconut the Monkey (green and pink variations). Glamour the Leopard (blue and pink variations). Magic the Unicorn (blue and pink variations). Myrtle the Turtle (pink and purple variations). Ollie the Octopus (purple and orange variations). Peanut the Elephant (pink and orange variations). Spells the Owl (blue and pink variations). Surf the Dolphin (purple and pink variations). Each Teenie Beanie Boo is polybagged and comes free with the Happy Meal. They are also available to purchase from Mcdonalds restaurants for between $1 and $2 (the cost appears to vary on which location you are in) without the need to buy any food. This promotion is only available in the USA. How many Teenie Beanie Boos have you collected? 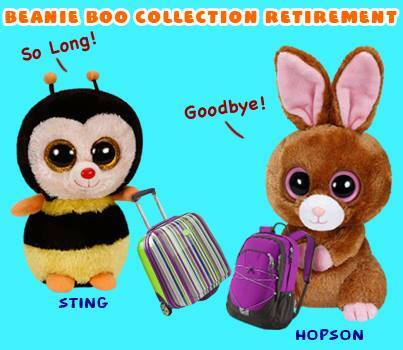 Ty have announced that Beanie Boos Sting the Bee and Hopson the Rabbit are to retire! Sting was introduced to the Beanie Boos collection way back in January 2012 so he has had a good two year run. 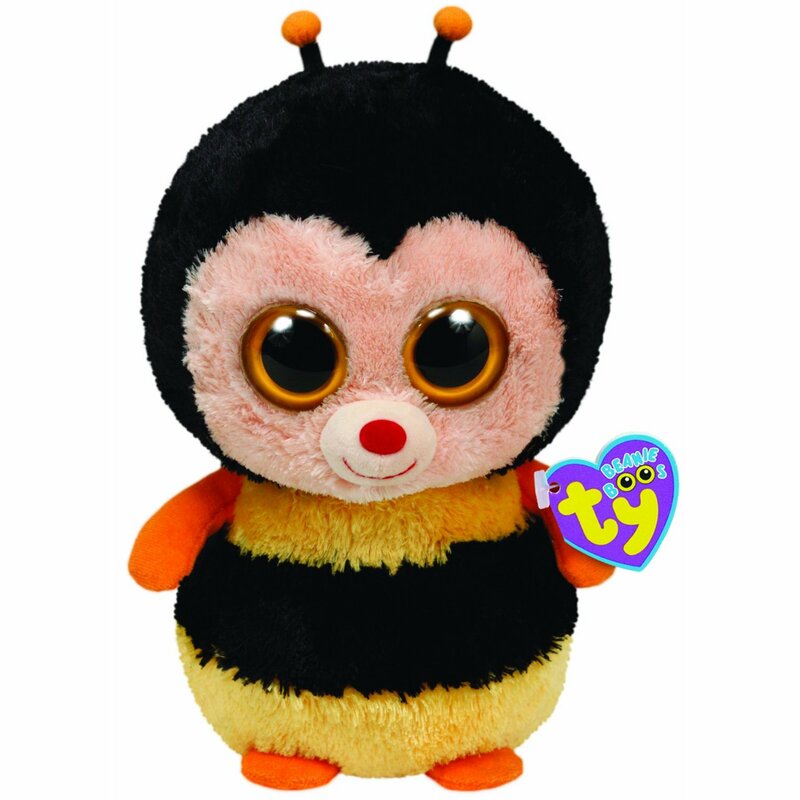 It will be sad to see this cute little bee disappear from the shelves. Hopson has only been available since January last year. The little brown bunny will now be spending his time relaxing in retirement. He will also be looking forward to his birthday at the end of next month. It will be sad to see these little guys go, however there have been plenty of new Beanie Boo releases this month to collect, so stay tuned! Good bye Sting and Hopson! We’ll miss you! Listed below are the potential Ty collectibles that could be released between the end of this year and into Spring next year. The beanies in the list have been collected from various resources, including rumours, so it’s quite possible that some of the following won’t be released.